Large jar made of dark plastic contains 120 ml of pure shea butter. Such large capacity and an affordable price make the butter a very popular product. The packaging is nice, the label is full of african patterns, warm tones and golden signs. The jar is nice, aesthetic and its design fully reflects the character of shea butter, which is hidden inside. It comprises 100% shea butter. The product is designed for hair as well as body. The butter has a very nice scent and is suitable for hair care (both low and medium porosity hair), has protecting properties. It regenerates strands and scalp. What is more, people who struggle with dandruff, atopic dermatitis, itchy scalp can successfully use it. The product will work as a soothing balm that will also help to get rid of the above mentioned problems. Moreover, it provides gloss, restores vitality, makes it soft and easy to comb. Thanks to the content of vitamins A and E, shea butter is a great antioxidant. Shea butter is mainly designed for low porosity hair, however, women whose hair has is leaning towards medium porosity and is becoming dry or unruly – can also be satisfied with this product. Butter is responsible for protecting hair against damages, is quickly absorbed and instantly regenerates strands. Shea butter has high absorbability because the fatty acids contained therein have tiny particles effectively penetrating inside hair. Therefore, if you want shea butter to weigh your wisps down in some way – you will not get that effect. However, if you have thick and heavy strands and you want to protect them from damages – shea butter will be your best friend. Butter is a versatile product for hair and body care. It can be used as a lotion, face cream, hand cream and foot cream (or apply a thicker layer of the product as a mask to selected parts of the body). 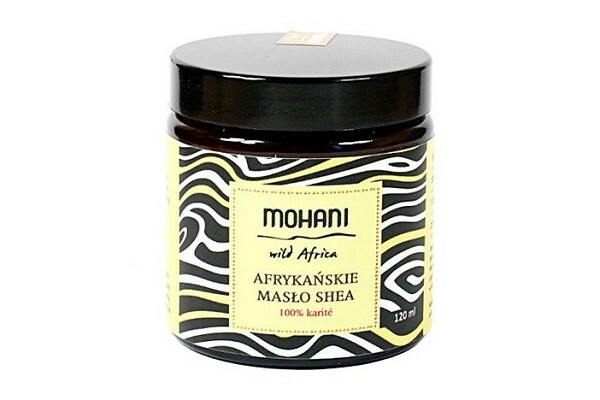 Shea Butter from Mohani will be most of all perfect for hair. It can be used as a mask, hair conditioner (also a leave-in conditioner), hair ends serum or a paste for hair styling. Mohani Shea butter is a great product of large capacity and a reasonable price. Even though the packaging is not very impressive (like for example shea butter released by Institut Karité, what matter most in this case is the content. Mohani offers Shea Butter in a large capacity at a low price.